We are working on two train trips and a bus trip. All meals will be included in the Convention Registration Fee if you stay at the Convention hotel. Those staying off site will have all meals except breakfast in their fee. Information will be posted as activities are confirmed. Convention Activities will be listed below and updated in a timely fashion as we approach the June launch date, so stay tuned! To book rooms, block will be open and hotel registration will begin August 1, 2018. 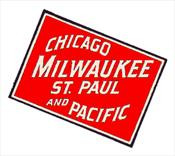 Mention you are with the Milwaukee Road Historical Association convention to receive the group rate. Hotel Registration Phone Number is 651-455-3600 - Select Option 2. Do not try to book online or you will receive a SOLD OUT message!! Remember, this day event is included in your full convention price. However, you must sign up for this tour on the convention form. Since we can only take 50 women, it will be first come, first served. There will also be two evening presentations for the women on Thursday and Friday. Model Contest: We will have an all-scales/Milwaukee modeling contest this year. Any item can be entered in any scale as long as it is a Milwaukee Road item. The models will be housed in the Company Store and all attendees may vote on what they consider the best model in the show. Bring as many entries as you'd like. MRHA Convention Attendance Policy: Only current members of MRHA, their families and guests, former Milwaukee Road employees, and those presenting or assisting in the Convention are permitted to attend. Display Tables: Any member or vendor is permitted a complimentary sales and/or display table. Anyone desiring more than one table will be required to pay a fee of $15 per additional table to the Emil Skok Restoration Fund. Tables are limited and a reservation MUST be made in order to obtain one or more tables. Changes in Convention Activities or Programs: While MRHA is proud to present a diversified and interesting convention for its members, as detailed previously, forces beyond its control may cause cancellation or change in the activities or programs. Such cancellations or changes may be made without notice and do not constitute a breach of contract. Refund Policy: MRHA will refund any canceled Convention fees (minus a 10% fee to cover fixed costs) if notified in writing or email by June 1, 2019. No refunds will be issued after this date except in cases of proven emergency (serious Illness, death in the family, etc.). Our Convention hotel is the Envision Hotel in South St. Paul. Reservation can be made by calling 651-455-3600 - select Option 2.. When making reservations, be sure to mention the Milwaukee Road Historical Association Convention to receive our special rate. Do not try to book on line as you will receive a SOLD OUT message. Convention fees do not include the cost of your hotel room. You must first login to the website in order to register. Please login to register. Copyright 2019©. Milwaukee Road Historical Association.